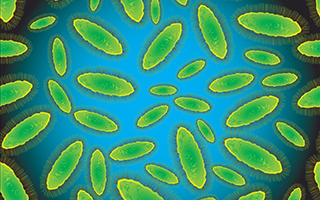 You probably already know that bacteria are key in healthy digestion and immunity. But did you know they can affect your mood as well? One new study suggests they might even affect depression. Researcher Timothy Dinan and his colleagues at University College Cork in Ireland are looking at what they are calling psychobiotics to discover other ways probiotics can help us. Dinan describes a psychobiotic as "a live organism that, when ingested in adequate amounts, produces a health benefit in patients suffering from psychiatric illness." They believe these bacteria can positively impact depression and other stress-related disorders. Your gut contains approximately 1 kg of bacteria, but the makeup of it changes from day to day. Many factors affect it, from your diet to your stress level. Even the way you were delivered at birth affects your microbiota. And if you experienced severe stress early in life, such as maternal separation, this can alter your gut makeup for life. Dinan and his colleagues decided to see if they could reverse these effects with the right bacteria. They studied rats who experienced depressive behavior as a result of maternal separation. The researchers treated them with the probiotic B. infantis. The effects of the probiotic were astonishing: the rats' behavior and their previously abnormal immune responses returned to normal. These results and others like it strongly suggest that probiotics can positively affect both behavior and immune system in humans. One of the reasons psychobiotics work is that they have anti-inflammatory effects. Inflammation contributes to both depression and stress. In other cases, the cause of depression is infectious diseases like syphilis or Lyme disease. Psychobiotics trigger the immune system to help relieve the depressive symptoms. Dinan and his colleagues report that "the intestinal microbial balance may alter the regulation of inflammatory responses and in so doing, may be involved in the modulation of mood and behavior." There haven't been many human studies yet to determine which of the many forms of probiotics could be considered psychobiotics — and whether psychobiotics are truly effective in humans. But a few small studies resulted in participants who took probiotics feeling less stressed and in better moods than those who took a placebo. More research is needed, but early results are certainly promising. So instead of looking for another medication for depression or a stress-related condition, consider taking probiotics like Advanced Probiotic Formula and eating fermented foods. You may find that they're the missing link that allows you to feel better without drugs. And as an added bonus, your digestive system will benefit as well. "Are Probiotics a Promising Treatment Strategy for Depression?" Science News, Nov. 14, 2013.